Paris hotel accommodations for a family of 5, 6, 7, or 8 in one room are listed in alphabetical order below. The interactive Google map shows each location of the family friendly hotels in Paris. The price or rate range of each hotel is indicated with the $ symbol. See the $-symbol key in the sidebar. 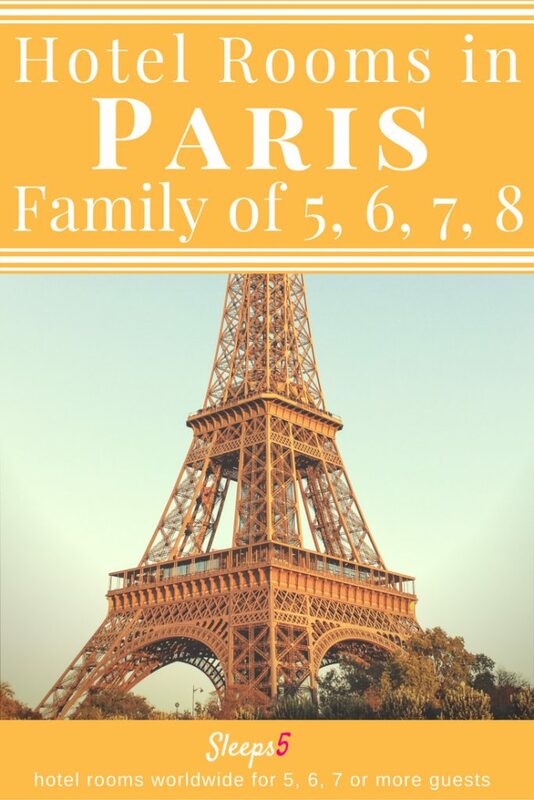 For more details about one of the Paris hotels with family rooms, click on the hotel name for a location street map, the hotel’s address, phone number, website link, email address, and how to book. Large hotel rooms, suites, and apartment hotels are included, for budgets from affordable to luxury. At least eight of the family hotels are very near Disneyland Paris. Family rooms in Paris do exist and we’re happy to help you find the ideal one for your family travels! Please email us or comment below to tell us about a family hotel in Paris not already listed here, or with advice about where to stay in Paris with kids! Hi, we stayed in three different hotels in Paris last week. We have kids aged 6, 9 and 12. The first was Residhome Val dEurope, one stop with the RER from Disneyland Paris. The entrance to the RER is only across a small square, and a big shopping mall is a few minutes away. We had a small apartment with one bedroom and a living room with a pull-out couch and a pull-out chair. There was a kitchen area with everything we needed to make dinner. At around 90 euros for one night we found it a bargain. We then stayed at Disneyland Hotel, which is already on your list. In Paris, we stayed at a nice budget hotel, Hotel Marignan in rue du Sommerard. It’s in the Latin Quarter, a couple of minutes walk from the entrance to metro Cluny la Sorbonne, which is connected to RER B and C, very convenient from both airports. We had a nice room that originally had a double bed and two single beds, and they had added a comfortable extra bed. There was a desk, a closet and a couple of chairs. They have rooms for 1 – 5 people, and you can choose to pay for shared or private bathroom. A small breakfast is included (baguettes, croissants, jam, cheese, orange juice, coffee and hot chocolate). They have a kitchen and laundry room that guests can use. A bit dated and they could probably work a bit harder with the cleaning, but I’d definitely stay again, as the location was perfect! Forgot to add that they have fixed prices at Hotel Marignan if you book directly with the hotel, we paid 174 euros for one night. We had private bathroom with a tub (we could have managed fine with a shower and paid 20 euros less). We are truly thankful for your taking the time to let us know about your family hotel findings! That apparthotel, Residhome Val d’Europe sounds great for families heading to the Disneyland Paris area! I hope your time at the Disneyland Hotel was also comfortable, and that it worked great for your family. Thank you for describing your experience at Hotel Marignan. It’s wonderful to hear about the details and your assessments, like that the extra bed was comfortable, and the other furniture pieces. It is included on the Sleeps5 Paris page, and I’m glad to see that the amenities are just what the hotel describes. Your notes about the transportation will also be really helpful for other traveling families!